The following graph shows anomalies of sea ice area from the 1980 to 1999 mean for Wipneus's area calculations. This shows the same sort of drop of anomalies as is seen in the Cryosphere Today Area index. The years 2007, 2010, 2011, 2012 and 2013 all show 'cliffs' in early to mid June (around the 18 June point on that graph). Fig 1. Anomalies of sea ice area 2007 to 2014. The vertical axis is mislabelled and should read 'area', not 'extent'. Such cliffs are indicative of area losses being far greater than average. But what is causing this situation? I have previously interpreted these as being due to the rapid spread of melt ponding, which has then pre-conditioned the ice for greater losses later in the season. I don't think that melt ponding and the role in preconditioning is in doubt, but can the area anomaly drop in June can simply be seen as a sign of the spread of melt ponding? I will deal with the actual June Cliffs of recent years at the end of the post, but for the bulk of the post I will use the area loss between 1 and 30 July, this makes analysis more consistent and as the anomaly cliffs strongly affect June losses, I view the monthly loss as a reasonable short-cut. Note that in the rest of the post June losses are shown as 1 June Area minus 30 June area, so are shown as positive. Fig 2. June area loss, and NCEP/NCAR surface temperature (horizontal axis 1979 to 2014). June losses of sea ice area are seen to be variable, however in 2007 and 2010 to 2013 losses are around 3M km^2, these are the years that show a June Cliff. I've also plotted NCEP/NCAR June average surface temperature, this is the surface temperature north of 70degN, from 0degE to 300degE, a region chosen to cover the most of the Arctic Ocean ice pack, while leaving out adjacent landmasses (notably northern Greenland). Including part of the Atlantic Ocean is seen as a reasonable compromise as temperatures here may affect the Atlantic ice edge. 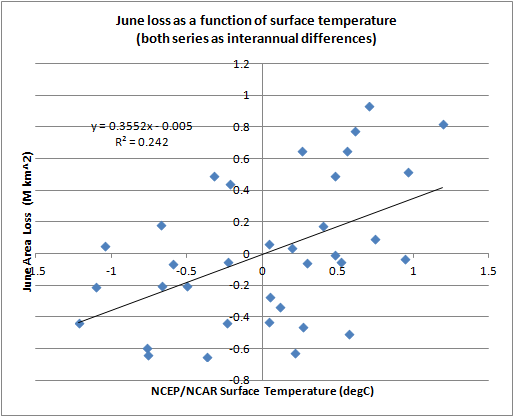 Figure 2 is suggestive of a relationship between June area loss and temperature, this is further examined by a scatter plot between area loss and temperature. The post 2007 years are highlighted with pink borders. Fig 3. 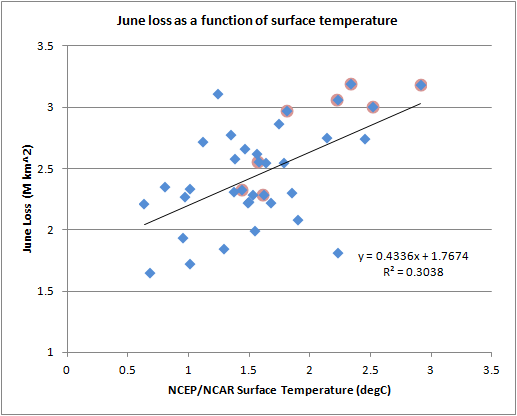 Scatter plot of June sea ice area loss as a function of NCEP/NCAR surface (see text above). This scatter plot is fitted with linear trend, the relationship is statistically significant to 95% confidence, the trend is positive; warmer temperatures result in greater ice loss, although with substantial extraneous variability. 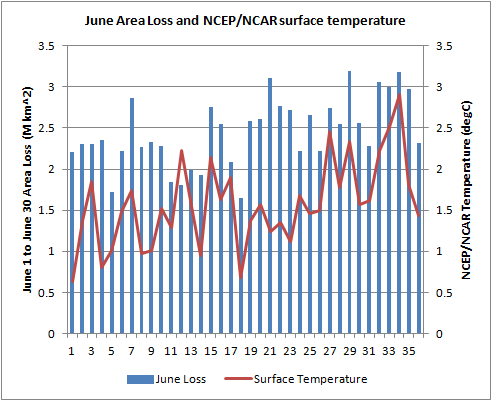 However both temperature and June area loss have positive trends, this needs to be addressed. Fig 4. Scatter plot of June sea ice area loss as a function of NCEP/NCAR surface, detrended by interannual differences (see text below). In figure 4 the relationship between interannual differences of temperature, and of June sea ice area loss, are shown. Despite taking interannual differences the positive trend survives, but is no longer statistically significant. Nonetheless, the relationship that warmer temperatures lead to greater June losses of sea ice is not merely due to both factors having upward trends, as the relationship persists in the interannual difference. Warmer temperatures can reasonably be expected to have an impact on melt ponding, as the date temperatures rise above freezing can reasonably be expected to occur earlier with warmer average temperatures. However warmer temperatures can also be expected to impact recession of the ice edge. Fig 5. June area loss (anomaly from 1980 to 1999 baseline), for the whole NSIDC domain, within the Arctic Ocean, and outside the Arctic Ocean. In figure 5 the Arctic Ocean consists of Beaufort through to Barents, the Greenland Sea, Central Arctic, and Canadian Arctic Archipelago (CAA), a convention used throughout this post. While in the record sea ice loss year of 2007 loss in the Arctic Ocean accounts for the majority of overall loss, and this remains the case in 2010 and 2011, in the record loss year in 2012 and in 2013, area loss outside the Arctic Ocean accounts for only half of the overall area loss for the whole of the NSIDC Arctic domain. Breaking the NSIDC domain into three regions reveals further detail. Pacific is Okhotsk and Bering, American is Baffin, Hudson and the Gulf of St Lawrence, and the Arctic Ocean is as described in the above paragraph. Fig 6. 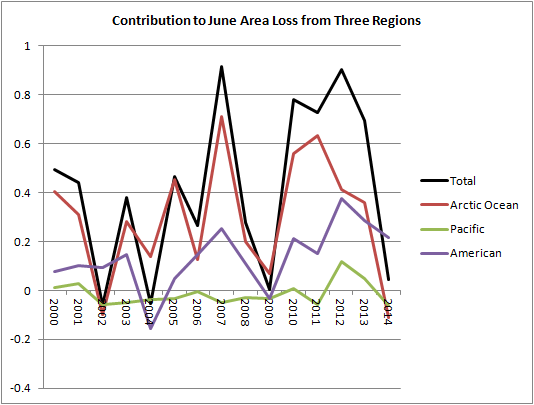 Total June area loss anomaly since 2000 in three regions (anomaly baseline 1980 to 1999). 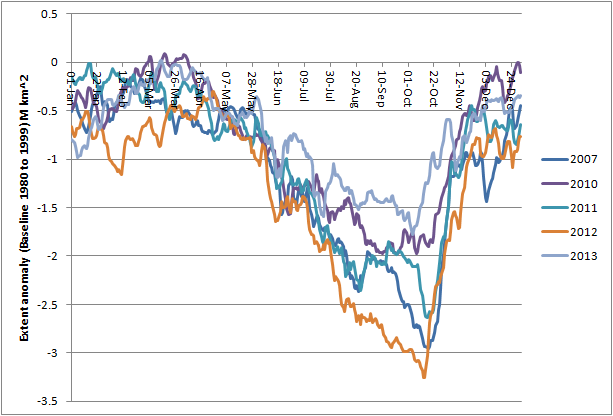 Here, while the June losses of 2007, 2010 and 2011 are seen to be largely due to the Arctic Ocean, the Pacific and American split shows that the greatest player outside the Arctic Ocean in June losses for 2012 and 2013 was the American sector. In both 2012 and 2013 Baffin and Hudson Bay account for virtually all the loss, Hudson Bay accounting for around 60% of total losses in the American sector, around 20% of total June losses in 2012 and 2013 were from Hudson Bay. So it is clear that despite 2010 to 2012 sharing the similar behaviour of cliffs overall June losses were due to substantially different geographical patterns of loss between 2010 and 2011 and 2012 and 2013. Turning now to the June losses within the Arctic Ocean. If melt pond spread is involved in the cliffs of recent years this might be apparent in the loss of area well away from the ice edge. So I have broken down the June losses into three regions within the Arctic Ocean: Central Arctic and the CAA. The Peripheral Seas, Beaufort round to the Laptev Sea, mainly bounded by land. The Atlantic Seas, Kara, Barents and the Greenland Sea, are seas bounded by the Atlantic. The results are expressed as anomalies from the 1980 to 1999 period, and the average for that period is shown for comparison. Fig7. 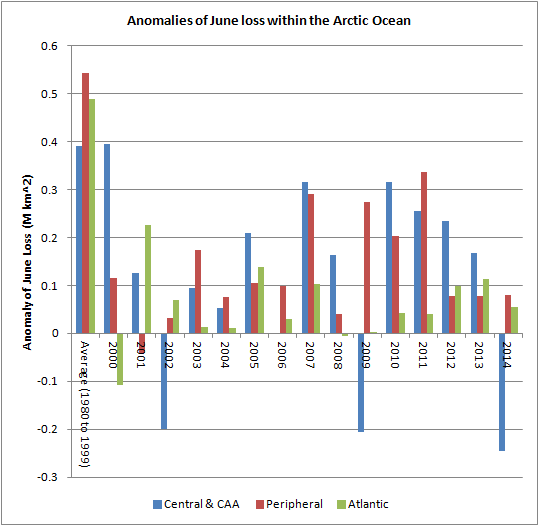 Anomalies of June loss of sea ice area from 2000 to 2014 (anomaly baseline 1980 to 1999). 2007 shows massive area loss from the Central Arctic and CAA, regions well away from the ice edge in June. So this could be taken to argue for melt ponding. However in the 2010 to 2013 period losses in the Central Arctic region decline, throughout the period, from 2010 to 2012 an argument could reasonably be made for melt ponding in the Central region causing greater than average area decline within that region where the ice edge cannot be expected to play a role. Before I move on to the closing two arguments concerning melt ponds and the June area anomaly cliff, there is an interesting diversion. 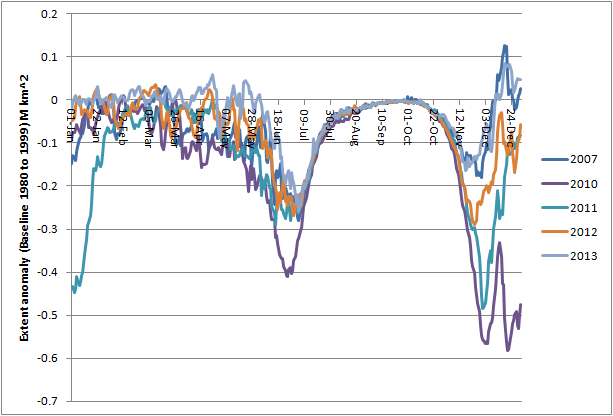 In figure 8 I have plotted the timeseries of June area loss / June extent loss. Compactness is area/extent, this is not compactness, but it is a similar metric. It is basically telling us about the relationship between the reduction of area and the reduction of extent during June, the significance of this being that the reduction of extent is driven by the ice edge, not losses away from the ice edge. Fig 8. Ratio of area and extent losses in the whole NSIDC domain for June, loss = 1 June - 30 June. The significance of this is that in the past (e.g. 1980s) area losses were on average 1.5 times greater than extent losses. Through the period, particularly after 2007, this seems to have shifted such that area losses have grown closer to extent losses, in other words there is less room for a role for area losses within the pack away from the ice edge. 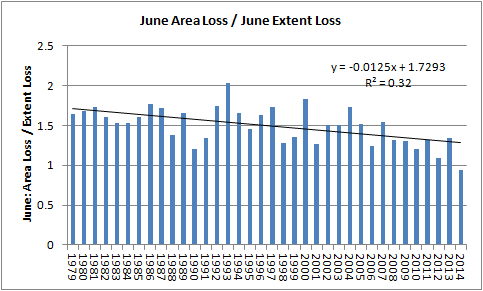 It is noteworthy that for the first time in June of this year (2014) extent losses were greater than area losses. I'll be delving into this metric in weeks to come, it would be interesting to see what is happening in other months. Going back to the main issue at hand. I've taken gridded NSIDC sea ice concentration data (NSIDC0051). My code hasn't been re-written to cope with the recent dataset as yet, only the finalised dataset is used, but that's not a problem 2014 plays little role in the issue as seen above. Each NSIDC binary file has concentration of sea ice in 250 levels, data for 1 June and 30 June have been used for the period 1990 to 2013. Taking concentration on 1 June, the area lost for each grid cell is calculated and then used to calculate the overall area lost for each of the 250 levels of concentration. This is significant because, apart from years like 2012, concentration within the pack is generally quite high (>90%), and is seen to be distinct from the ice edge as seen in NSIDC concentration plots for the June average (NSIDC G02135). Even in 2012 concentration over most of the internal pack away from the ice edge is still between 100% and 80%. Using such judgements I have broken the base data of area loss as a function of 1 June concentration into three bands: 100% to 80%, 79.6% to 40%, and 39.6% to 0 %. Arctic Ocean is as defined previously, regions outside the Arctic Ocean are calculated by subtracting Arctic Ocean results from the results for all NSIDC domain. Taking the whole of the NSIDC northern hemisphere domain, recent peak June losses are seen to be in the years 2007, and 2010 to 2013, the years with June area anomaly cliffs, fig 9. 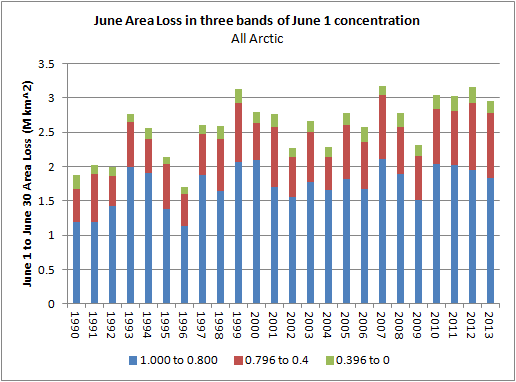 Fig 9, June 1 area loss as a function of concentration on 1 June (three bands) for All Arctic. What is surprising, especially in light of the behaviour shown in figure 8, is the strong role in June area loss typically played by grid boxes with a high concentration (100 to 80%). And for the recent high June loss years this high concentration ice would seem to be playing a strong role. The advantage of this method over the regional based approach of considering the Central Arctic as being away from the ice edge is that this takes into account sea ice in regions that are away from the ice edge. However as with the regional approach, concentrating on the Arctic Ocean alone and the picture of strong area loss in 2007, and 2010 to 2013, driven by spread of melt ponds within the pack is made less plausible. When we look at the Arctic Ocean we see that the years concerned do not show a strong consistent pattern of unusually high area loss from areas with 1 June concentration of 100% to 80%, which are away from the ice edge regardless of region. 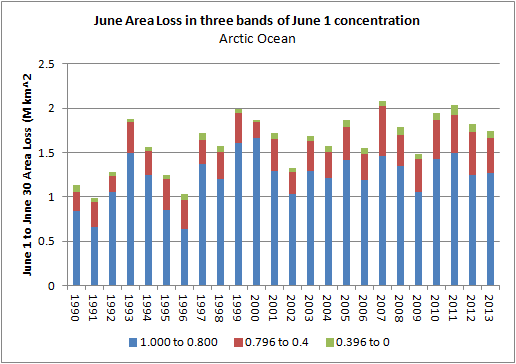 Fig 10, June 1 area loss as a function of concentration on 1 June (three bands) for Arctic Ocean. Putting some numbers on that Arctic Ocean graph, the table below shows the average loss for 2000 to 2006, and the high loss years 2007, and 2010 to 2013 (High Years). The greatest contributor to the increase was from ice with a 1 June concentration of between 79.6% and 40.0%, this is ice typically found in the region of the ice edge. In total 70% of the increase in loss between the two averages is associated with ice near the ice edge, not within the centre of the pack. 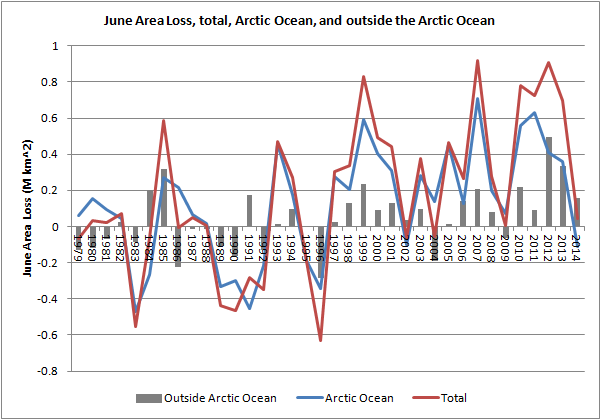 Turning now to the regions outside the Arctic Ocean we see strong losses in both 2012 and 2013 (greatest June losses since 1979 by some margin). So as with the regional based analysis, 2012 and 2013's June losses were in large part influenced by regions outside the Arctic Ocean, and in this presentation it is seen to be enhanced area loss from regions with mid-range concentration on 1 June. 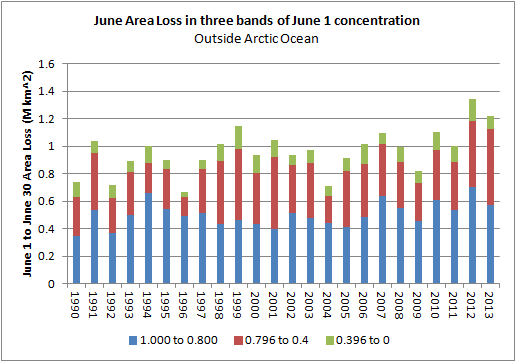 Fig 11, June 1 area loss as a function of concentration on 1 June (three bands) for Outside of the Arctic Ocean. 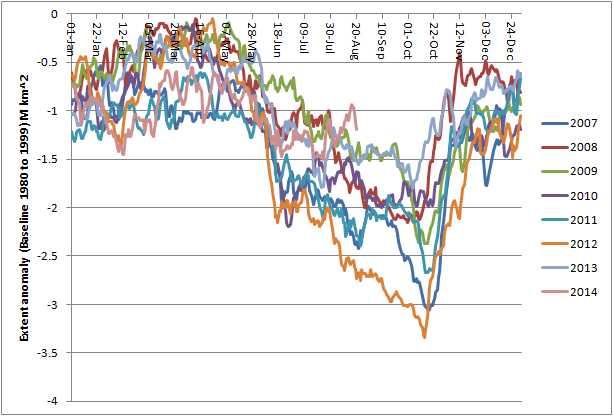 Concentrating on the years in question, I have plotted the anomalies of area for those years alone in figure 12, below. Fig 12. Plot of area anomalies for the whole Arctic, showing the years with strong June anomaly cliffs (baseline 1980 to 1999). The vertical axis is mislabelled and should read 'area', not 'extent'. 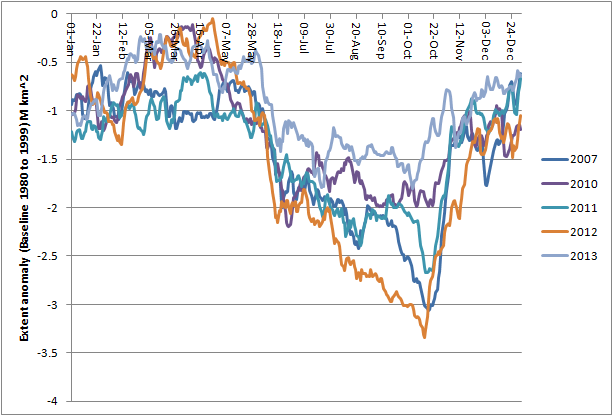 In figure 12 the steep drops are clear as compared to rates before and after (drops around the 18 June marker). If the drops are due to spread of melt ponding within the Arctic Ocean then they should be unaffected by showing only the anomalies for the Arctic Ocean, which are shown in figure 13. Fig 13. Plot of area anomalies for the Arctic Ocean, showing the years with strong June anomaly cliffs (baseline 1980 to 1999). The vertical axis is mislabelled and should read 'area', not 'extent'. 2012 still has a cliff in the Arctic ocean but half the size, the other years are less notable, but they too have cliffs, albeit much reduced. However as it shown below in figure 14, it is around the time of the June anomaly cliff in 2007, 2012 and 2013 that there is also a drop in anomalies in Hudson Bay. Fig 14. Plot of area anomalies for Hudson Bay, showing the years with strong June anomaly cliffs (baseline 1980 to 1999). The vertical axis is mislabelled and should read 'area', not 'extent'. So a role for melt ponding 'fooling' satellite sensors into seeing a drop in concentration is not dismissed, I was too strong in an earlier comment on the forum. But I do not think that the evidence adds up to the recent June cliffs being from the spread of melt ponds at in early June. It seems that some 70% of the increased loss of area in the recent Junes with 'cliffs' is actually due to ice associated with the ice edge, and other regions play a non-negligible role. Re: your 70% summary number - this seems to be based on the Central Arctic and CAA measurements and the table following Fig. 10. Is the percentage similar if you run the calculation for All Arctic (Fig. 9)? The 70% is based on the whole Arctic Ocean, including areas outside the Arctic Ocean didn't seem relevant as I'd already identified the role of early melt in Hudson and Baffin (Pacific). The conclusion surprised me too, even though I backed off from my initial impressions.